(Newser) – One of the huge selling points of OxyContin is that it boasts of keeping users free of pain for 12 hours, thus allowing them to sleep through the night. But an investigation by the Los Angeles Times finds that the claim doesn't hold true for many patients, and when the drug wears off hours early, they "experience excruciating symptoms of withdrawal, including an intense craving for the drug." It is, as one patient puts it, "a description of hell." Solution? Take another pill, or one with a higher dose, a cycle that can lead to dependency. 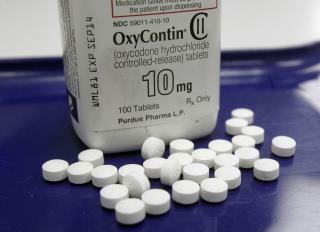 "The problem," write Harriet Ryan, Lisa Girion, and Scott Glover, "offers new insight into why so many people have become addicted to OxyContin, one of the most abused pharmaceuticals in U.S. history." Drugmaker Purdue Pharma has long been aware of the problem, but has pushed back hard against complaints because the drug's popularity and revenue "hinge on its 12-hour duration," says the Times. Sounds good. Now I wanna try it. Take a couple good belts of Scotch, Black Jack or Rye with a little soda and the pain goes away These modern pain killers can kill more than pain, like you for instance. It's rather difficult to do with booze unless you intend to.